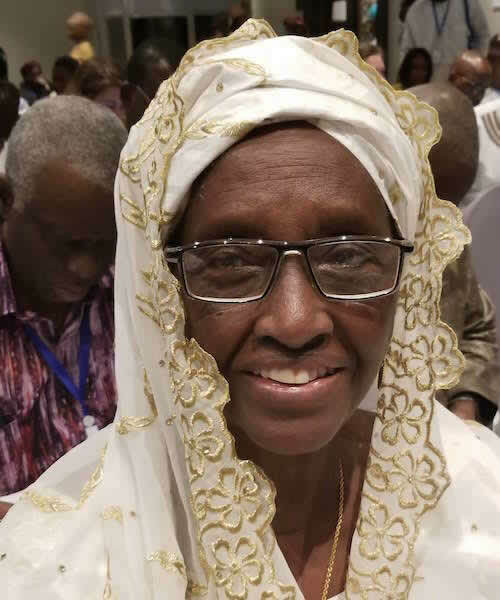 Background: Hadja Mariama Sow has witnessed the history of independent Guinea firsthand. From the time of Guinea’s Independence in 1958 through the present, she has been a leader in many fields. Her roles include women’s organizations, interreligious action (currently she is a co-president of Religions for Peace), politics, and Muslim religious affairs. Today, as a widely respected elder, she advocates especially for women and girls, focusing on issues around family welfare and rights. She sees particular potential for change through religious communities, given their capacity to influence and mobilize, as well as their focus on core values and human rights. During the Annual Meeting of the Ouagadougou Partnership in Dakar in December 2018, she and Katherine Marshall explored her unique perspectives on how approaches in Guinea and across Africa have evolved over her lifetime. The conversation explored the distinctive history of women’s political and social engagement in Guinea, including in religious communities, work for interreligious peace in West Africa, national reconciliation, and critical issues facing women and families today. You have lived at the center of Guinea’s history since independence in 1958. How did you get involved? I began when I was very young! I was in high school at the time of the election for independence on September 28, 1958. In Conakry, at the girls’ high school that I attended (now the October 2 High School). I was born and grew up in the village of Tountouroun, which is today a sub-prefecture of the administrative region Labé. I had done well in school, especially in mathematics, and I wanted to continue my studies, but I ended them after the baacalauréat for family reasons. I married in 1961, and I have eight children. My husband is an engineer and was governor in several places in Guinea (Faranah, Forécariat, and Conakry from 1976 to 1984). So instead of going to university, I did a training course and began teaching. In parallel, I participated in youth movements, which were important at that time (the early years of former President Ahmed Kékou Touré’s administration). When did you become so involved with women’s movements? I left the youth organization in 1972, and became involved in organizing the Union of Revolutionary Women of Guinea. I was elected as an officer and was responsible for the finances of the administrative office. After the death of the first president of the Union, Hadja Mafory Bangoura, I was elected president of that organization after an interim period. In 1982, I was elected president of the African Regional Coordinating Committee for the Integration of Women in Development, at Addis Ababa. What this highlights is that the women’s empowerment that we speak of today is nothing new to us. Since then, I have become more and more involved in the mobilization and sensitization of women across Africa, to ensure that we are always present in the fight for the the development of our independent countries. Former President Ahmed Sékou Touré played a critical role in ensuring women’s participation in this agenda. The prerequisites for empowerment include education, training, employment, etc. In 1970, I participated in the first global assembly of youth in New York. In 1979, 1980, 1981, and 1983 I participated in the United Nations General Assembly as a representative of the Republic of Guinea. From 1972 to 1984 I was a deputy in the National Assembly. In 1979, I was honored with the National Order of Merit of the French Republic by French President Giscard d'Estaing. In 1975, I was honored with the National Order of Merit by the President of Upper Volta. And what happened after the Sékou Touré era ended? In light of all that happened during the period around his death, I decided to leave politics. I did not like what I saw. It was not all bad, and there was much good that was accomplished during those years, especially for women and youth. I have not been involved since then in political movements. Since 1990, I have been a part of the Union of Ulama of Guinea for Culture and Science. What had been the approach to religion under Sékou Touré? Religion was very organized under his presidency. At first there was a Ministry for Islamic Affairs, which later became the Ministry of Religious Affairs since Guinea is a secular country. I became increasingly involved in organizing the associations, and I eventually became the president of all the associations of Muslim women. I was working to mobilize and organize women in religious affairs. And today, women participate in all religious activities in the mosques, churches, and all the structures that preside over our religious traditions. Even more important, women learn the Qur’an, not only to recite and memorize it, but also to interpret it. Christian and Muslim women work closely together—they established the organization of women of faith, of which I’m the president. And what is the position of Qur’anic education in Guinea? There are Franco-Arabic schools and Islamic schools. In these schools, the national curriculum is taught, alongside Qur’anic studies. How do you see progress on girls’ education? Education was made compulsory under Sékou Touré—may his soul rest in peace—for both boys and girls. That is not an issue in Guinea. That is an aspect of dictatorship that I like and support! I call it good governance, not dictatorship. And how did that apply to the position of women more generally? Women were clearly the best organized within the Democratic Party of Guinea. There was a single women’s organization, called the Revolutionary Union of Women of Guinea. Guinean women supported many other African countries in establishing women’s organizations or improving work conditions; for example, in Gabon, Togo, Sierra Leone, and The Gambia. For example, I went to Gabon to participate in the establishment of women’s organizations. We organized and supported small businesses on dying indigo fabric and established centers for the advancement of women targeting girls who had been forced to interrupt their studies, and for others. In Guinea, early marriage was forbidden, as was polygamy. But the figures on all these social practices for Guinea are far behind other countries. What happened? It is true that Guinea is among the countries that have not yet succeeded in fully applying the regulations. Nevertheless, the government is working on this seriously. How and by what means is change taking place? There are certainly difficulties, but steps are being taken to enforce everything that’s beneficial for our population. Religious actors are involved in supporting the state on family planning and the reduction of infant and maternal mortality, in line with our religions. How do you see prospects for religious commitment to family planning? The effort to develop family planning in Guinea cannot succeed without the full commitment of religious and traditional leaders. But this has become a reality because they are all committed to supporting the government in achieving this goal because it’s in the best interests of our population. You should write a book about your experience! Not yet. But I have drafts and I plan to do it in the near future. What is your vision on sexuality education? This still seems to be a sensitive topic among religious communities. What is happening in Guinea? It is true that it is a very delicate subject because if it is misinterpreted it becomes a handicap that blocks progress on the topic. But fortunately, nowadays, the State and the religious leaders are involved and searching for appropriate ways of teaching comprehensive sexuality education. We also need to restore parental responsibility. How did you get involved in the World Council of Religions for Peace? After inter-religious councils were established in several West African countries—including Guinea in 2001—I was elected a member of my country's interfaith council. And during a 2002 meeting in Sierra Leone of the interfaith councils of Guinea, Liberia, Sierra Leone, and Côte d’Ivoire, I was chosen as coordinator for women of faith of these different countries. Since 2002, I have been participating in all the meetings organized by the World Council of Religions for Peace. throughout the world. And in 2006, I was elected co-president of the World Council of Religions for Peace at its sixth World Assembly in Kyoto (Japan). Despite your withdrawal from mobilization and national politics, you have been involved in the nation’s transitions and in work for peace. How did that begin? How were you involved in the Community of Sant’Egidio’s mediation work during that period? Indeed, the National Transitional Council (CNT) was set up after the death of the late President General Lansana Conté. And I was chosen by the Religious organizations to be part of the CNT. Within this assembly, nine working commissions were set up. I was elected by the members of the reconciliation, solidarity, and human rights commission as president, and it’s in this role that I participated in a CNT mission to Sant’Egidio in Italy to benefit from its experiences in the context of reconciliation.